This Tarot reading stuff. Divination or Counselling? Merriam- Webster: Divination: the art or practice that seeks to foresee or foretell future events or discover hidden knowledge usually by the interpretation of omens or by the aid of supernatural powers. 2 : unusual insight : intuitive perception. Depending on the reader, it may be either or both. There are Tarot Counsellors who specialise in taking a counselling approach, often based on Jungian training. These readers may not handle the psychic challenges of divination and forecasting. Other readers, working the psychic approach, may offer valuable, sensible advice but without a basis in formal counselling. 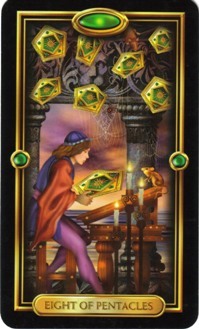 In preparing for a reading, Tarot, runes, cards etc; the agile reader can only prepare to respond. The person will wish for verifiable feedback, or how else can they see if you know your stuff? They will want feedback, advice, prediction, hard, workable information, or they may be fragile or tired, looking for a bit of hope and cheer. But it has to be credible, to them, in the form that it takes, and spouting la- la is cheating and it ain’t going to cut it, nor does it deserve to. You must take your cue from the cards or runes or whatever is your oracle of work. That’s what you learned it for and what you have presented at the point of sale or service. It isn’t about you. Questions will often be presented as entirely hard boiled, to do with money or business outcomes. The client may want a yes or no answer; is this merger going ahead, will I win or lose this court case, if I spent 50 K on building this extension to my premises will I get that money back when I want to sell? Time will tell whether you get it right, and you better had, far more often than you get it wrong, or you won’t be doing this work for long. But nothing is ever entirely factual and hard boiled. Wherever time, thought, worry, hope and effort is invested, there are high emotional stakes. There are also those questions where the only validation possible is in the heart and mind of the other person and whether or not your answer finds resonance within them. Here’s a recent (disguised) example from a social media forum, readings free of charge. Responder 1: A better question would be asking such spirits who they are to get your answer. Responder 2 : Ask them who they are!! I have 4 guides and they always come in 2’s. Never by themselves. Responder 3: Katie-Ellen: I don’t think so, not in a literal sense, but I see mourning. The Fool card represents the unborn. Is this why you are asking? Are you grieving a lost baby? Questioner: Yes, and my other children seem highly attracted to my tummy all of a sudden and clingy. Its weird. Katie-Ellen: I am so sorry. It is a grief like nothing else. I know this from personal experience. But in answer to your question, no, I think based on your cards here, there is no ghost. The Fool card especially, says the little one’s returned to source, held safely again in the palm of the Universe, or God, whatever you like to call it. The Tower and the 9 Swords, I see as reflections of you, your own shock and sorrow. You would not want baby stuck and trapped at your side, being a soul too small to know why. You can make a shrine inside yourself, in your heart, with a candle there to light the way back to life one day for that little soul, and in that way, you can be the baby’s very own guardian angel for all time. Questioner: I love that idea! But why do my children keep wanting to touch my tummy? Katie-Ellen I think that perhaps your children are responding to your grief and they feel the source of it. They’re wishing to comfort you and also they want to be reassured themselves that everything’s all right. Questioner: So not a ghost then? Katie-Ellen: I’d say the baby is gone to source again safe and sound, and the ghost now is the memory and the aftermath of loss. Your body may feel like a haunted place for the time being, not because the spirit of the baby is there but because mind and body are one. But it’s not for me or anyone to say for sure. The one card in the Tarot most suggestive of a ghost…as in an active, ongoing haunting is The Moon card. It’s absent here and a card is sometimes actually most conspicuous by its absence. Questioner: That’s such a weight off my mind, I can’t begin to tell you. This was not about divination as such. It was non- factual and non-verifiable. But was it counselling? I’ve done some of that work and training in previous jobs. Maybe I do use it unconsciously sometimes. Look at the replies from those first two respondents, those replies reflected a philosophy, and in doing so, bypassed the story actually cards altogether, and did not seem to raise the question in their minds – what was the reason for this lady’s question? My response, whether ‘right’ or ‘wrong’ – meaningless terms here – were prompted by the cards themselves, cards not drawn by me. These were the questioner’s own cards- so that I acted simply as an outside translator. There are facts, there are truths and there are poetic truths. Author Katie-EllenPosted on September 5, 2017 March 6, 2018 Categories agony aunt, applied psychology, card meanings, cartomancy, human, Intuition, Katie-Ellen Hazeldine, psychic, psychic writer, readings, UncategorizedTags counselling, divination, Ghost, Lancashire, psychic, runes, tarot, writerLeave a comment on This Tarot reading stuff. Divination or Counselling? The Three of Spades and the Psychic Burp. There are many weightier matters I find myself investigating with cartomancy; the use of ordinary playing cards for divination, using these instead of, or alongside my tarot cards. I may find myself investigating business questions, will this merger go ahead, and when? etc etc I could be surveilling what seems likely to happen next vis a vis Brexit etc. I do look of course. Wouldn’t you? I occasional post readings on public matters, but heck, Life is also made of little things, and who needs pointless hate from total strangers on social meejia in this overheated alt-climate. I don’t see Yellowstone blowing any time soon, or World War V, and they’re rather weighty matters. We have recently been on our travels, an undertaking by car and ferry, and for me, by wheelchair, touring in France: The D day beaches, Pornic in Brittany, Rocamadour in Lot in the Dordogne, a night in Nantes and north again for a final night in beautiful Bayeaux before catching the ferry home again next day – a 5 hour crossing to Portsmouth. Rocamadour is spectacular in the extreme. We stayed in a small hotel, Les Esclargies– at the top of the great cliff above the famous sanctuary with the old main street below it. You can go down in a funicular. The hotel is in an oak clearing or glade and after a stormy 6 hour drive from Pornic, we arrived after heavy rain to see a red squirrel robbing a hanging bird feeder. We had a downstairs room with a good sized bathroom and wet room. We stayed a few days and late one afternoon, I sat outside with my cards while inside with the patio door open, Il Matrimonio snoozed. I shuffled my playing cards asking, what is Il Matrimonio doing right now? Why would I bother to ask when I already knew the answer? That is precisely the reason for doing it. To see if I draw the cards I expect to draw when I already know the answer, and to see if those cards are an accurate or meaningful reflection of those facts already known, harnessing that benefit of hindsight in order to challenge my accuracy rates in randomly drawing a relevant card. I expected to draw the Four of Spades in its most benign aspects. 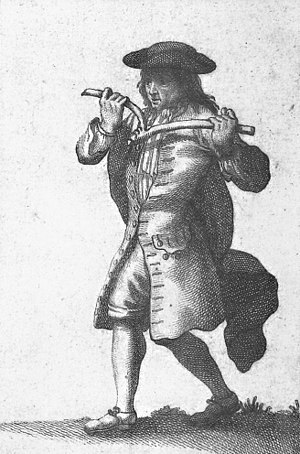 Traditional Meanings: Bed, rest, illness, recuperation, the need for caution, the sick bed, hospital room, coffin, a jail cell, rest, confinement, exhaustion, need to take it easy, move at a slower pace, bed-ridden, feeling fenced in, staying at home, an unhealthy situation, feeling trapped, feeling sick and tired. Gentle snorting noises proceeded to issue from the open door behind me. But no…I didn’t draw the Four. I drew the Three of Spades. 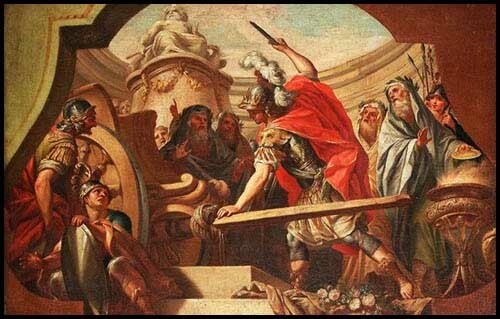 Traditionally: loss and deception, lies, misunderstanding, confusion, a growing problem, a worsening condition, deterioration, disease, infection, third-party interference, a third wheel, meddling, a love triangle, what goes on behind the scenes, trials and tribulations, a test, an exam. I associate it with the Tarot’s Three of Swords; heartache, separation, quarrels, mourning and sometimes literally, cardiac or respiratory symptoms. Il Matrimonio is somewhat prone to indigestion. I found that if he avoids gluten, he doesn’t seem to get it, but travelling, on holiday, avoiding gluten was not such a practical proposition for him, and besides, the croissants and pastries at breakfast were rather too delish. Uh oh, I thought, contemplating the Three of Swords, what’s this? I hope everyone’s all right at home, and as for him, I wonder if he’s got a bit of heartburn. And no sooner had I articulated this thought, there came a burp from inside and Il Matrimonio sat up muttering something about wanting the bicarb. I think that counts as validation. So, to add to the vocabulary of the Three of Swords, let us add, indigestion, heartburn, bicarbonate…and burps. Here’s the sting in this tale. I mentioned it immediately. We had only just switched the lights out when I felt the first sharp tug, but Il Matrimonio hadn’t noticed anything odd, not the first time nor the second time, but a bad night followed, for the first part of the night. Frightening dreams involving being pushed in a bed, a malevolent coven and the fear of imminent death. The epicentre was in Market Rasen in Lancashire, and it was teeny, but the experience when it actually happened, was eerie as hell. I don’t want even to imagine the terror of a big one. I reckon we can sense these things in the same way that birds and animals are known to do…given sufficient absence of distraction. And the Three of Spades, like the Tarot’s Three of Swords, can mean mourning. We returned to shortly receive news of a death, a phone call and it was an uncle of Il Matrimonio’s. This was a quiet death in hospital after a short illness and at the age of 82. It happened on the Friday following our last night in Rocamadour and apparently, some tube got pulled out of his uncle’s arm as he lay in his hospital bed, with fatal results although perhaps it would not have made any difference either way. Poor Il Matrimonio nurses kind memories of his uncle … tears were shed. Author Katie-EllenPosted on July 25, 2017 January 22, 2018 Categories agony aunt, applied psychology, art, business psychic, card meanings, cartomancy, clairvoyant, Death, Art, Mediums, mediumship,, divination, dreams, family, future, Jung, Katie-Ellen Hazeldine, mind,body,spirit, North West, Occult, parapsychology, precognition, psychic, tarot, tarot blog, Uncategorized, unclassified, visions, women, writerTags card meanings, card reading, Cartomancy, dreams, Four of Spades, France, precognition, psychic, Rocamadour, tarot, Three of Spades, Three of Swords2 Comments on The Three of Spades and the Psychic Burp. Tarot says, ‘nests and tests’. King Swords RX – this man has made a negatively perceived decision. Seven of Pentacles – this woman wants a home, is ready to cultivate an orchard. 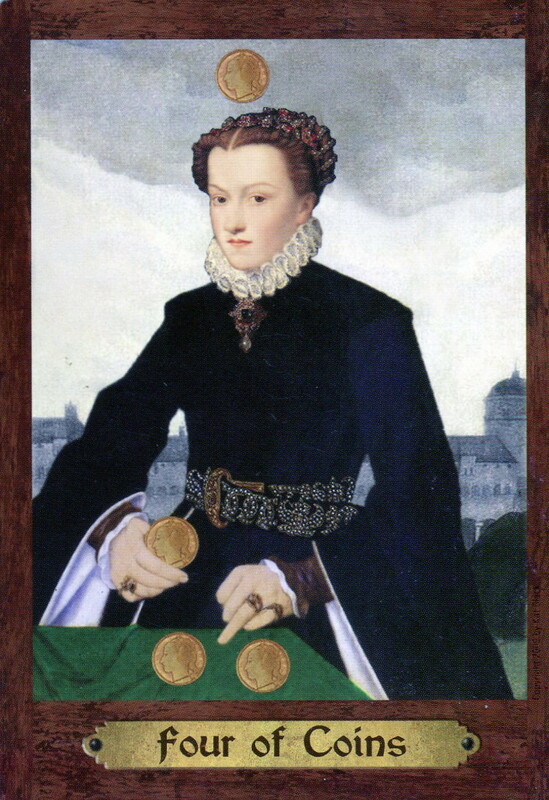 Nine of Pentacles Rx – this woman is a highly practical thinker, is queen of her own turf, and gives orders at work rather than takes them, but after more than three years together, not living together and without marriage or babies, she needs to see progress. Both cards reflecting these very natural motives are earth suit cards; work, money, bricks and mortar, foundations, security, comfort, what and whom pays the piper. Further cards: Page Cups, Ace Wands. The lady has a job she likes and is good at, in hotel management, but the birth card, the page of cups, talks about the biological clock, asking, when is a good time to start a family? No such thing perhaps as a convenient time, but for the woman in particular there may be a fear of leaving it too late. After so much time together, this lady seemed to feel it was time to put up or shut up. He declined the invitation (challenge) to move things onward and upward so she had withdrawn, although with expressions of regret. 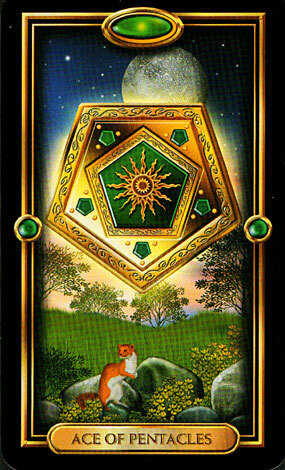 The Seven of Pentacles says she is reluctant to start all over again, however, so perhaps, and unless she meets someone extremely suitable for her in the near future, this card of harvesting a slow fruit may, just may, turn things in his favour if he wants to recover the situation and is willing and able to, but the Ace Wands – think, movement, relocation, speed, fire, (also conception) suggests he needs to take decisive action, and soon, to make that happen. To win the fair lady for keeps, he needs to ‘man up’, and fast. However, people tend to do whatever comes most naturally; advice will often fall on fallow ground and this is why my Tarot does not offer advice, except in the form of answering the clients clearly stated question. My client saw this as his predicament, and so it was, but he had unwittingly also created one for the lady, not seeing that her needs had changed while his had not. Many women seem to find themselves in just this same sort of predicament these days. That’s a whole other can of worms, but some choose the bird and afterwards they build a nest together. Some women nowadays build the nest themselves, then choose the bird to come and join them there or else they tire of waiting and looking and proceed to fill the nest, a queen alone. Author Katie-EllenPosted on January 23, 2017 February 9, 2017 Categories agony aunt, applied psychology, cartomancy, divination, dowsing, dreams, esoteric, esp, family, farming, future, help and guidance, human, Identity, Intuition, Lancashire, parapsychology, psychology, tarot reader, tarot tips, True Tarot Tales, Uncategorized, unclassified, writerTags business, Ciro Marchetti, Lancashire, People, psychic, relationships, tarot, The Gilded TarotLeave a comment on Tarot says, ‘nests and tests’. Tarot interpretation works on real life synchronicity, but what is synchronicity? A recent instance was during a reading via Skype. Classically this card refers to reaping a reward for hard work or patience and suggests that there will be a good return on a long term investment, but no quick returns. If it comes out reversed I’d be sensing a future poor performance or loss on your current or proposed investment. If you were a buyer, I might be sensing not to buy in this or that product range as not representing a good acquisition. It may either not sell well, or take forever to shift. The client was asking about the shifting of retail stock, but while money was the presenting issue, and as often happens, a card detail suddenly leaped out at me. ‘Do you have sheep living behind your house?’ I asked. And this is typical of what Jung meant by synchronicity. Does it mean I enquire about sheep every time this card appears in a reading? No. It absolutely doesn’t. It just so happened that on this occasion, it did. Would it appear in a reading done for a sheep farmer? If I was thinking of buying stocks or shares and this came up, would I go for it? Probably, depending on the surrounding cards. Tarot loves to start off a reading, playing parrot. Just as Art imitates or rather, conjures Life, that’s how Tarot works. As within, so without. The first thing I aim to do in a reading, is ask the cards to help me identify my client’s most pressing concern or question. The Tarot tells me by ensuring I draw the card that most accurately mirrors that unspoken concern or question, as closely as can be managed from among the 78 cards in a Tarot deck. This ‘mirror-card’ tells me and my client that we are on the same wavelength, which provides a reliable baseline for the rest of the reading. My Tarot did it again today, and deserves one of those little nectar pots adored by larikeets and parrots alike. The med is called Orencia or Abatacept. It is a new class of meds known as biologics. Orencia works to inhibit the production of T cells, T1 and T1. These are normal proteins, and are essential for your normal immune response, but if that goes wrong for any reason, they can go into overproduction, causing an inflammatory cytokine cascade resulting in acute pain and long term damage. These biologics, while for some they offer a last chance of respite, can be dangerous, so I thought I’d pull myself a few cards before injecting. The first card out was The Tower. Just look at that pic. How well did the Tarot do, with a deck of 78 cards to work with, shuffled and drawn blind and at random…in guiding me to draw this card, signifying the issue in question. Look at the card again. Look at the injector pen. This is how readers know their question has been heard and logged by their unconscious mind. 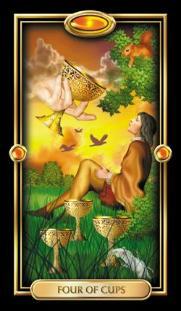 The first card out of the deck will mirror the stated question, or even the unstated question. This last card was also a suitable reflection as this med is is a weekly injection. I therefore concluded, that while I could not expect a miracle, or even a significant observable response, there would be no significant negative response; a finding which I am so far in a position to validate. Tarot does make me laugh sometimes. Or tries to and almost does, but not quite. A friend came to stay recently and brought a present for my birthday. We thought it might be fun for me to try and guess what was inside the packaging using my pendulum and cards. It was roughly cylindrical, not too heavy, rolled in bubble wrap and brown paper. I held my pendulum over it. ‘Are the contents of this package paper?’ No. ‘Ceramic?’ No.’ Wood?’ Yes. I drew the Three of Pentacles, a card signifying progress in business and pride in one’s work, and from The Gilded Tarot by kind permission of Ciro Marchetti. ‘Is it a craft item? I asked my friend. ‘Yes.’ she said, smiling from ear to ear, as ducks suddenly quacked outside on the pond and Il Matrimonio ran to the balcony to see there if there was a fox. There sometimes is. Then I drew the Six of Swords, a card of personal progress, solemn journeys and quests for learning. Was it something to do with a river or riverbank, I wondered. Was it a little wooden boat? Or a frog? I like frogs. ‘No’. My friend said, smiling, ‘But you are warm. Now open it! And inside it was – this! A wooden Indian Runner Duck. What a little character. Well, I never. No wonder she’d been laughing to herself every time we’d fed the ducks, knowing what she had in store to give me. Now, that is what I call a friend. And psychically, here was that darn Jungian synchronicity thing at work again. Good try, Tarot my friend. Not a bull’s eye this time, but a respectable attempt, and this often is how Tarot works in a reading, too, regardless of the classical card meanings, sparking ideas directly off the imagery. This is how, while Tarot presents a great academic study, anyone can read it, who likes to use associative thinking. Carl Jung speculated that the Tarot works according to the principle of ‘synchronicity’- that psychic insights are triggered by apparently random and yet meaningful co-incidence, which he thought might be explained by Quantum Mechanics. 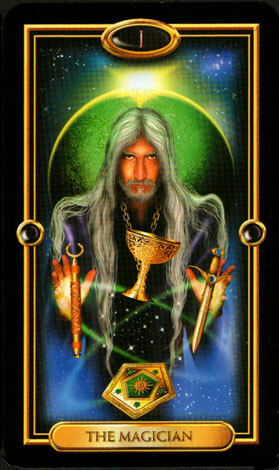 In a recent reading, the focus was the clients job, and I drew the King of Pentacles or Coins. Image below is from The Gilded Tarot by kind permission of Ciro Marchetti. 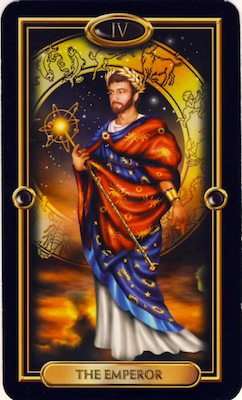 This Tarot king represents a man who is patient, kind, industrious. He is the salt of the earth. I said to the client that I thought he was a manager, and the work was practical in nature but also involved communication. It demanded precision or the ‘thing’ wouldn’t work but I didn’t ‘see’ as yet see what his job might actually be. What I meant by that was, I felt we were on the same wavelength. Now that is typical of the Tarot. An outing for the Tarot’s Moon card, with Katie-Ellen, UK Tarot reader, writer and business consultant. Happy New Year, and the tummy bug in question was nothing to do with me, I am happy to say, or the seasonal festivities. I was doing a Skype reading, investigating questions to do with ongoing and future creative projects- the client is an artist and sculptor, when I drew the Moon card. The image below is from The Gilded Tarot, by kind permission of Ciro Marchetti. Also available from Amazon but the publisher Llewellyn is getting this shout-out. Classical meanings for this card are; the Moon itself, Fertility, monthly cycles, tides, floods (alas), conception, confusion, deception, secrets, vivid dreams, visions, leaps of imagination, fantasy, art, animals, hunting, secrets, fraud, theft, surveillance, risk, travel with danger attached, disease. Reversed/Upside down: the meanings take on a different complexion, and may suggest any of these things- but they are fading away and now belong to the recent past. The key challenge for a reader is to decide which meanings are relevant, and quickly, not to bore witless and alienate the client. One must say the first thing that comes to mind. I call it ‘gob-shiting’and I really shouldn’t; it’s hardly elegant and perhaps this should be a New Year’s resolution. The thing is, the reader needs to just speak. I said the first thing that popped into my mind and asked whether a loved one had been ill, just recently, and perhaps they had gone down with a tummy bug? Or, could it even have been a bout of food poisoning, but whatever it was, they seemed to be better now? The reader of Tarot or any other divination system must learn not to self- censor. If they do, because their first thought seems just too stupid, they will likely get it wrong, and then want to kick themselves. Learning to trust yourself enough to do that is the hardest thing, or at least, I found it so and I still sometimes have to tell that inner critic, aka saboteur of the oracular mind, to shut up. People may well say, and many do, sod all the soothsayers. Wits or just good old common sense is what is called for, in working out a response to a problem. This is fair enough and often true…at least, it may be from where they are sitting. Nine times out of 10, in making their own predictions, they may prove quite correct. 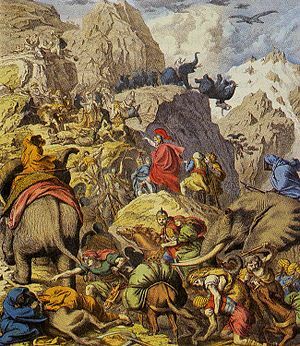 But what the oracular reader sniffs out, like a wild animal, using whatever oracle as a spade for digging in the primal mind, is what is hidden and could not wisely or even reasonably be expected. The Tarot is nothing but printed card stock, physically. But the imagery and its many and deep rooted associations facilitate telepathy, triggering both receiver and transmitter. The client is equally active in this process, at a level they are not consciously aware of, any more than the reader is consciously aware of why they said A and not B. 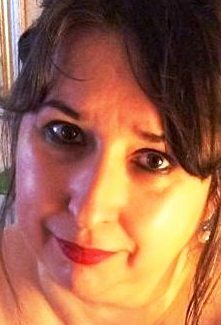 Author Katie-EllenPosted on January 2, 2016 April 8, 2016 Categories agony aunt, animal communication, animal psychics, applied psychology, art, Business Networking, business psychic, card meanings, cartomancy, Christmas, divination, dreams, flood, Fortean, ghosts, help and guidance, human, Intuition, Jungian archetypes, Katie-Ellen Hazeldine, Lancashire, learning tarot, Litopia, Lytham St Annes, Man, Myth, North West, novelist, Occult, oracle, precognition, prediction, psi, psychic, psychic development, symbolism, tarot reader, tarot readings, The Moon card, Uncategorized, unclassified, ZodiacTags business psychic, Ciro Marchetti, divination, Gilded Tarot, Lancashire, Lancashire writer, Llewellyn, psychic, psychology, tarot, tarot readings, TC Lethbridge, The Moon card, True Tarot TalesLeave a comment on Tarot Says, Tummy Bug! Can Tarot cards help with forecasting weather, accurately? The short answer is, experience tells me yes, but, and it’s a big but, the question needs a clearly defined context. As in, for example, what kind of weather can be expected at X location at X time? If I drive from A to B on this date at this sort of time, what kind of weather experience can I expect? The Tower Card detects coming severe weather. Storms. It featured in this way in quite dramatic fashion in a previous True Tarot Tale, when it saw a storm coming, and we only had a tornado down our street the very next morning at about eight- o- clock. That’s right. A tornado in Lytham St Annes in Lancashire, UK. The Tower card, from the Gilded Tarot by kind permission of Ciro Marchetti. Other associations: disaster, accident, argument, bankruptcy, shock. Today, just for a change, the story really is a story, prompted by activities on a writer’s forum called Litopia. Do, please feel welcome to come and join there. Boreas was bored. The North Wind was fed up of the North. Grizzling and moaning, he stamped about, bending trees, rolling rivers like mattresses and forcing polar bears to roll down snowy slopes, so he could laugh at the way their paws scrabbled as they rolled over and over. ‘Where’s some fun!’ he howled. ‘F*ck off , Captain Bird’s Eye, I want a bit of Southern Comfort!! !’ He ripped off some roofs in Carlisle, straining to go south, but the jet-stream was busy in the higher latitudes, and wouldn’t open the gates. He steered Nota north, skimming seas into mountains and making dolphins sea- sick, isobars winding ever tighter until Boreas saw her, crossing the Atlantic towards him, driving the waves before her. And then they collided, and circled tighter and tighter, high and low . Wires and cables snapped and hummed, and dustbins flew like dust, and wild things cowered in their dens. Shrimp and rice and coconut! Fish and chips and doughnuts! The way he loved her was frightening. They parted peaceful on the shore. Tarot Says, Eat Yer Greens! A client had parted company from a boyfriend . This was indicated by the appearance of the King of Cups Reversed, and Page of Cups Reversed. The lady said it had happened two years previously, and there had been no particular boyfriends since. Two years was a long time for a lovely lady so young. Why was he still showing up in her cards? I drew the Ten of Swords. Nasty card! and asked her if she was prone to headaches, neck pain or even migraines, and she said, yes, it was a problem sometimes, usually stress related, but she had started taking a targeted multi supplement, and was hopeful of improvements. Had someone also let her down quite badly, I asked, because the Ten of Swords can indicate a sense of betrayal, as if, you know, a stinker of a headache isn’t enough to be going on with. The ‘King of Cups Rev’ had done a bit of a cowardly dirty, but when and how might she meet someone new? There was a lack or loss of confidence, and a high degree of personal integrity by which, naturally, she measured others, combined with a lack of ‘bounce’ which could become a barrier to approach, or to change and opportunity. The message I got was, here was an excellent girl, deserving of the best but perhaps she needed to ‘lighten up.’ The men most likely to approach her at present were ones she was not likely to fancy, while the ones she might fancy might steer away of a sensed earnestness. Go lightly. Safety first, but then a bit more easy come, easy go. But it is far easier to see this about someone, than for them to see it, and decide they can do something about it. Tarot thought it might help, to paint a picture of the previous unworthy swain, such that she could let go with a sense of satisfaction, because the terms of parting had been dictated by him not her, and there was a lingering sense of injustice. I drew The Knight of Pentacles Reversed. The image is from the Gilded Tarot by kind permission of Ciro Marchetti. Positive associations: steadfast, patient, reliable, salt of the earth, rooted, industrious, green-fingered, constructive in endeavour, stamina. Negative Associations: conservative, lazy, lethargic, mean, dull, two speeds; go slow and stop, greedy. ‘Oh, you’re GOOD!’ she said, smiling from ear to ear. A Tarot reader aims to serve. What serves is sometimes whatever acts, in however limited a way, to cut a Gordion Knot. 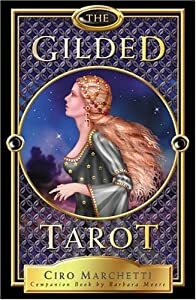 Author Katie-EllenPosted on November 9, 2015 January 2, 2016 Categories card meanings, clairvoyant, divination, esp, psychic, tarot, unclassifiedTags Cartomancy, Ciro Marchetti, clairvoyant, Decks, Divinatory esoteric and occult tarot, Gilded Tarot, knight of pentacles, psychic, relationships, tarot, unclassifiedLeave a comment on Tarot Says, Eat Yer Greens! I recommend inquirers to visit my website before booking. This is for their benefit, to make sure I’m the right kind of reader for them. Not every reader offers the same kind of service, and I would far rather lose a booking than disappoint a client’s expectation. The client arrived and was polite but continued cagey to the point where it threatened to become counter-productive. I drew The Emperor card confirming what I had already suspected, and asked if he worked for the Government, was he is the civil service, Armed Forces or Police? 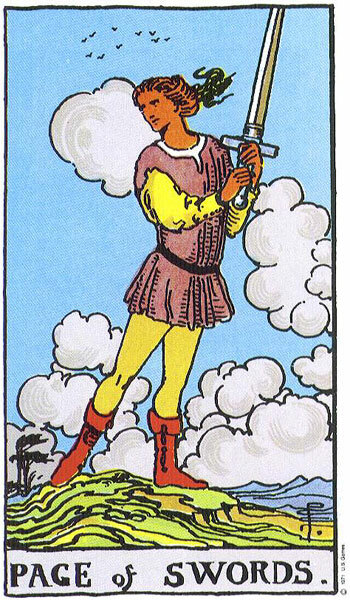 He replied with some reluctance that he was in the Police, while a further card, the Seven of Swords, elicited that he worked in Fraud investigating. I’ve read for a few police officers (purely off-duty) and had no problems. This was like pulling teeth, except I’ve never pulled a tooth. It was like pulling up a dandelion, or getting Il Matrimonio to tidy his clothes away. I asked if he had visited the website, as I had suggested, to know how I conducted readings. 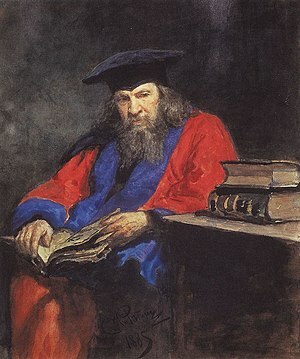 He had not had time, he said, and I reminded him of what I had said on the phone, that I start readings cold, and expect to deliver ‘psychic’ insights but thereafter, a reading works as a dialogue, and this is how I am able to deliver a useful reading, drilling down on precise particulars. Please do not do this to your reader. Of course any reader with half a brain will tap into social cues when doing readings. Why ever is this considered the sign of a charlatan? A reader with poor observation skills is a social munchkin and unlikely to deliver a meaningful psychic reading either. I sensed he was hoping for a bit of help, but would not value whatever was not delivered cold. I had already sensed disquiet attached to his marital situation, and said so, but he had so far declined to verify this. Now I drew the Page of Swords Reversed and said, ‘I sense a legal issue. An unwelcome communication. A letter, an email. Have you received it or are you sending it? There was a pause while I drew more cards. I was not at ease. Stonewalling is socially hostile and I needed to make sure my own discomfort did not skew my impressions about the card. ‘Yes,’ he said, and the Tarot proceeded to share its insights surrounding this event and its ramifications past, present and possible future. That might seem a reasonably specific psychic hit for someone who does not advertise as a clairvoyant (though I am sometimes, and sometimes clairaudient) but he remained unresponsive, politely thanking me for my time when we finished. It is your time and money, and the reader’s time and energy. Research their service. Oh no! Oh, yes, I’m afraid. I wish it wasn’t so, but I undertake to demonstrate divination at work in the real world. Sometimes it’s fun, at least for me and I hope it is for you but sometimes it just can’t be. The title gives fair warning. Pass by if you can’t bear it, but if you’re learning Tarot, try to stay with it and not flinch. You may one day find yourself faced with someone in deep distress, hoping to find not solutions or advice, but some kind of sustenance, or at least meaning in their situation. The Tarot will rise to these occasions, if you will. because the Tarot is you, yourself, your deepest, archaic and arcane self. This is a true outing for Tarot’s Death card, as drawn from my beautiful new deck, Kat Black’s Touchstone Tarot. Her Golden Tarot is another favourite, but one likes to ring the changes now and then. It’s duckling time again out on the pond, and Nature is wreaking carnage, red in beak and claw. The most relentless predators by day are the sea-gulls. There are two duck mothers this season; one with an excellent track record of rearing and one with a dismal record. The successful mother has for the past 3 years, the neighbours downstairs tell us, reared at least 6 ducklings to independence from a brood of 12-15. The less successful mother loses them all and cries loudly. Anyone who says animals don’t feel what we do doesn’t watch closely enough. If they forget more quickly than we do, if they do, and I have my doubts, well, they need to, and it’s a blessed mercy. It was cold, and the dismal duck was down to the last of her twelve ducklings on Monday night when Il Matrimonio went over to the pond to feed them, watching as the last duckling ran calling after its mother and she ignored it, eating and then wandering off. Maybe she had given up, and decided it was just no use, and all was lost. A gull alighted, lingering near the duckling as it crouched shivering, calling for its mother. Seeing this Il Matrimonio could bear it no more, and it was not a ‘good’ thing to do; he knew that; we’ve watched enough David Attenborough, but there it is. The HUMAN animal, male as well as female, is hot-wired to respond to the cry of an infant in distress, and to the immediate, the personal and the particular. Therefore, enter Il Matrimonio with one shivering duckling. 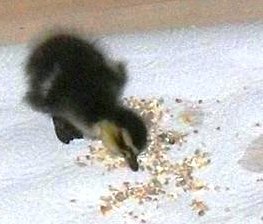 By bedtime it had eaten enthusiastically (not bread; proprietary duck food) It had drunk lots, splashed about in a shallow dish and done much sitting in cupped hands, clearly regarding these as a warm place and acceptable brooding alternative. It slept on a towel in the bath, curled into the lap of a large teddy bear. Next day it ran around, ate, drank, paddled, pecked my bare feet, calling for its mother, and was incessantly demanding of Il Matrimonio’s cupped hands for brooding. Ducks can count, of course. There was no question of her being fooled by the appearance of an extra duckling. ‘It would be murder,’ said Il Matrimonio. The other duck was unlikely to accept it. The one hope, and it was a long shot, was to get little D big enough to be safe from gulls, then return it in clement weather, and let it take its chances then. And indeed, it seemed to grow bigger even overnight. 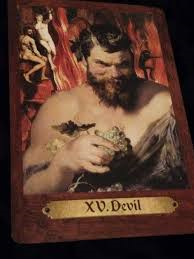 But after Il Matrimonio brought D in on Monday night, I had drawn The Devil card, The Four of Coins and Death. 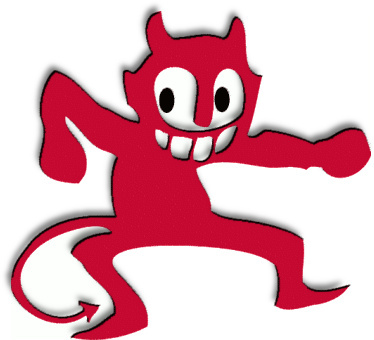 The Devil shows Pan/Nature in violent aspect. This is the truth, that Nature is full of violence. One creature or many creatures must die for another to live. The Four of Coins represents holding on, a holding action, a brooding of money or other material possessions or objects. Death speaks for itself. 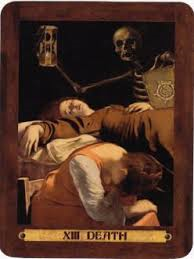 Many Tarot readers today won’t have it that the Death card may actually represent Death. Too unpalatable. Sorry to disagree. Call me old-fashioned, but the oracular mind is not susceptible to convenient reinvention. The Death card does not always mean physical death, it is true. It may mean an ending in any other sense, or a transforming situation such as the ending of a job, or other situation, but to say it never does is to create the most enormous elephant in the room. Sometimes it has meant exactly what it says. Death as represented by this card is usually natural, often timely, rarely cruel or violent. There are worse cards the Tarot could use if it needed to communicate a sensing to do with such a terrible picture as that. Little D passed away very early in the morning, found lying with her eyes shut, still warm, head snugged into the lap of the teddy bear. Tears in my cup of tea. Sick? I asked the Tarot? Had she got too cold? Stressed? ‘Strength Reversed’, replied the Tarot. Little D had no strength left. It had all been just all too much. She was too dead tired. 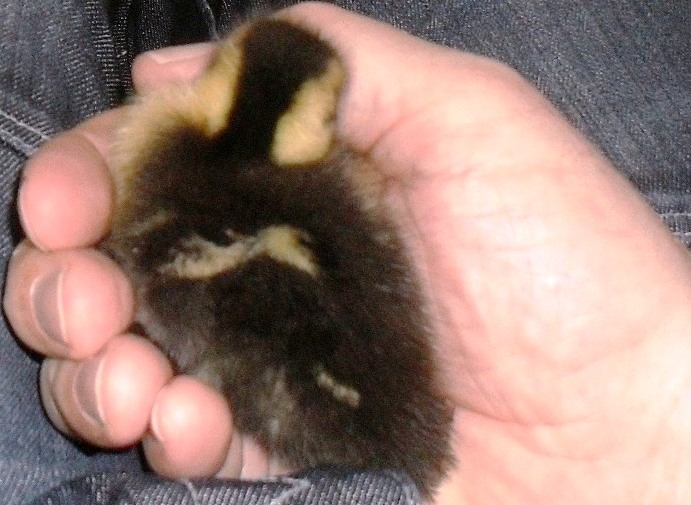 Read here for Mallard Duckling Rescue information. She had recently moved address and had two cats, both girls, Elsa and Salem. Elsa was very gentle, borderline dozy, Salem’s practically a genius. Here they are. Elsa top, Salem below with RT. You might be forgiven for wondering which one is the thickie and vice- versa. All I can say is, Salem was being seriously disrespected, being made to wear that pink combo which was actually Elsa’s. Where might Elsa be? Let me say loud and clear I had no idea, how would I? I drew the Moon card first, look at the picture, and put it to my daughter, that Elsa-cat might have been frightened from returning by a barking dog living only a door or two away. She confirmed there was a barking dog Elsa didn’t like. Image from The Gilded Tarot by courtesy of Ciro Marchetti. Other meanings for this card: lies, hunting, danger, tricky travel, infection, fertility, psychic dreams,paranoia. But this immediate pictorial association was most I felt was most relevant to Elsa’s absence. Often this is how a Tarot reader works, look-and-speak-and-sod-the-book-meanings. Next, I drew The Four of Swords; a knight entombed. This card signifies isolation, sickness, hospital visits, chapels and tombs and raised the obvious question, had she got stuck or trapped? I thought of wheelie bins and asked was a collection due next morning? Artemis was horrified, thinking of a notorious incident in the media where a woman had maliciously swiped a kitty into a wheelie bin but the refuse collectors had already been that morning, and I decided Elsa was not trapped inside a wheelie bin, but might well be hiding behind one. I drew the Five of Wands and asked RT had she been to Number Five to ask if Elsa had been seen there? Yes she had, and the woman had kindly checked her out-houses. She asked, was Elsa coming home that night? I drew three more cards, all upside down and said no, I didn’t see that, but I tended to think it would be all right. Elsa was not dead. She was not hurt. She was disorientated by the move, and hiding, no more than three properties away. Animals may be the primary department of St Francis, but that former librarian, St Anthony, patron saint of lost things, has kindly helped us with lost beasts before, and I suggested she ask him for help in bringing Elsa home. Next morning I received this message. Elsa-Smellsa just found 🙂 Could hear plaintive meowing when we called from the back garden coming from property to our rear so walked round and found her cowering down a little ginnel! She was very hungry but none the worse for wear. Salem was behaving very strangely this morning. I think St Antony acted through her somehow…It was her lead I followed when listening out for the meows! What did I tell you? That Salem cat’s a genius. Yes, and of course, thank you too. Thank you very much, St Antony. A sample reading demonstrating these cards in action. Anonymous Question on Quora: Can Anyone Help, Please? The person’s question was ‘Is My Boyfriend a sociopath?’ I drew The Ace of Pentacles. Their Second question was “Will I ever get pregnant?” I drew Ace of Pentacles again. Their Third question was “Is my bf being truthful to me?” I drew The Hermit. Goodness. These are loaded questions with much anxiety attached. And no- one likes to bear discouraging news but these questions reflect discouragement, to say the least. Hearing what you don’t want to hear is the risk you run in consulting with oracles, while sometimes, in reading for ourselves we might be too close to the question, and struggle to see the wood for the trees. Based solely on these cards, no further cards drawn; I sense this man is not a sociopath. Very far from it. He seems a quiet person. Perhaps cool, withdrawn and ungenerous in communications. How kind or loving a person he is, or how good under pressure I can’t assess based on these cards alone. He’s probably OK with animals, at least. They don’t demand conversation. Whether he is generally truthful, a card from the suit of Pentacles is not generally indicative of deceit. It may still denote a charmless misery guts or control freakery; someone who may be aloof, mean, miserly, grumpy, greedy or selfish at times, but it is not associated with deceit or active, purposeful malice or cruelty. And sociopath is a strong word indicative of cruelty, whether verbal or going beyond that. 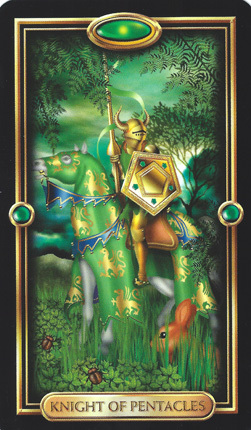 This person, based on these cards, tell the odd lie to safeguard what he feels is his necessary space. He may fib if if he feels pushed. The question you have not asked, but which is an elephant in the room would seem to be; do you want to keep him, and and if you do, why? 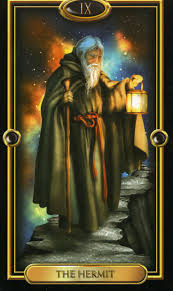 The Hermit clearly suggests it may be wise to take time out, let go, go silent, quietly release him to go his own way. No need for a scene, no need to spell it out. Just see if it does a natural death once you step right back. That way you will get to see what he then does or does not do to retrieve the situation. And then you can decide how to respond. At the very least, have a change of scene, go somewhere quiet, a walk in the park. There seems to be a substantial money issue between you; whether this is out in the open or not, with one or the other of you possibly not grasping a basic nettle; a financial nettle. Do you both work? The Ace of Pentacles suggest there will very likely be a child for you at some future time while The Hermit warns you against pregnancy at this time, and certainly in these circumstances. You are being warned here, and very clearly, not to set or fall into a trap, forcing any issue between you. If he isn’t forthcoming, won’t meet you half way, it may be that he doesn’t want the same things you want, at least, not at this time. If he says that he doesn’t, believe him. If he is withdrawn, there is some problem. Your questions do not bode well for your confident future together. What is coming across is your doubt and mistrust. He may be a sociopath, he may be a liar, you suggest. These are angry questions. Why do you want him? 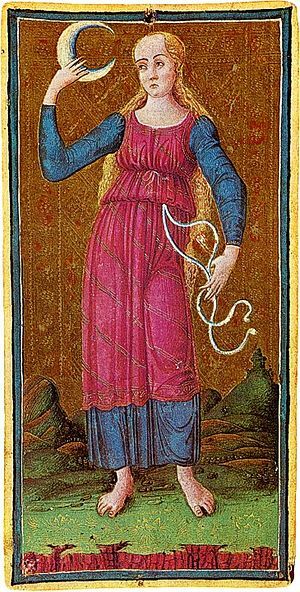 The Ace of Pentacles suggests not only a money issue but perhaps an age or maturity issue, especially in conjunction with the Hermit. Is he quite a bit older than you? The Ace often signifies a new job, sometimes a new home. I sense you will have the home you wish for one day, but you may need to walk alone awhile between now and that time, and if so, it will be all to the good, even if it does not feel that way right now. I hope there is something here that you can use for the best. The cover image for this post is the Three of Cups from the Gilded Tarot by kind permission of Ciro Marchetti. It signifies rejoicing, parties, friendships and news of weddings and births. 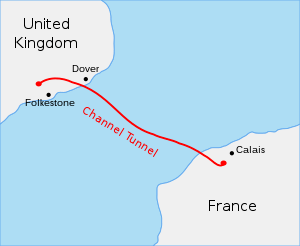 Il Matrimonio dreaded the schlepp from Lytham to Dover one Wednesday afternoon. He particularly dreaded the return journey on Thursday evening much as he loves and worships his car. I call her Black Betty. Skip if you don’t like this rock classic. The journey down proved tedious in the extreme, starting with delays at Luton, which persisted one way and another the whole of the rest of the way down. He rang on Thursday morning to ask me to look in the cards for clues as to the optimal time to set off on his return journey. This was shaping up ominously. An accident at the Dartford Tunnel had been backing up the roads all the way back to Sevenoaks. He thought he might wait until 9.00PM before setting off, what did the Tarot suggest? Tarot felt he should set off earlier. ! had my cards beside the phone, loose in a heap and all facing down. I swirled them about with my free hand and pulled out four cards. Against 7.00 PM I drew the Two of Swords. A lady sits, blindfolded, holding two crossed swords. If you leave at 7.00 I told him, you’ll have a largely clear run, but there will be one slower patch, maybe roadworks. If you leave at 8.00, I said, looking at the Ace of Swords, you should have a straight clear run, or at least, the best you’ll get. That was because this card represents a) a good decision and b) represents a sword that cuts a Gordion Knot, or to put it less politely, cuts through the crap. From The Gilded Tarot, by kind permission of Ciro Marchetti. Il Matrimonio by no means acts on all such suggestions coz we all have free will, innit? Although as he had set out, Tarot’s rival, the great god, Tom-Tom, had predicted an arrival time of 00.45. There were no jams or problems whatsoever during the 330 mile drive home. Tarot beat Tom-Tom. Yay. I have had the cards out on a few football questions recently, out of interest. Not my interest, particularly, but Il Matrimonio’s. This is such a poisoned chalice. When I get stuff like this right, he’s intrigued and chuffed, but he’s likely to turn round next day and say it was a good guess, or deny I’d told him what I’d told him, the treasonous reptile. If I get it wrong, he’ll jeer, whereupon I beat him back into his vivarium, and would throw a cockroach after him, if I could find one. I’ll have a go at these questions anyway. I’m not charging for this work, it forms no part of my professional service, not directly. It’s to benefit my own study. How else does may one study the workings of intuition except to test it on those questions where one has no emotional stake? Recently, he asked me to consult the Tarot re: Wigan Athletic v Manchester City in the FA Cup Final. He said this was impossible, that none of the pundits agreed. Why not, I asked? Because, he said, Man City were second in the Premier League, Wigan Athletic were in the bottom three, and Wigan hadn’t scored against Man City since 2007. His objections to the forecast were based on trend, but a pattern may break at any time. Right or wrong, that was what I saw. The odds were in Wigan’s favour plus, I’d got The Magician as the outcome card, and The Magician is Mastery of Skill. The Magician from The Gilded Tarot, by kind permission of Ciro Marchetti. So, how had I decided this? By means of a counting spread, and by using reversals (allowing upside down cards) as a way of qualifying the odds numerically. I shuffled (which I do abominably) asking, ‘Wigan Athletic to win?’ Then I drew three cards and laid them out in a row. How many upright (‘dignified’) cards did I have? Two out of three. the middle card counted for 50%, the flanking cards for 25% each. The middle and final cards were upright, and the final card was The Magician. This was a wonderful card in the circumstances. It is the ultimate card of Skill and Mastery. This forecasting method has proven highly reliable. Not infallible, I ‘m no such thing and would never claim to be, but I’d expect to get it right 90% + of the time and am perplexed till I understand why I miss the mark when it happens. Today, however, I was asked another football question, and arrived at a response very differently. This time I did not reach for my cards. I was preparing lunch, I just said ‘wait,’ and paused, knife suspended fatefully over an imperilled avocado. ‘Crystal Palace?’ I said aloud to myself, and upon saying this felt a mild but distinct spasm on the left side of my neck which ran down my left arm into my fingers. It was mildly unpleasant, like the crawls you might get, pedalling your feet in bed at night when you’re low on magnesium or other salts. Noting this reaction I said, ‘Crystal Palace to win’. ‘They’ve just scored,’ he said. ‘Fifteen minutes to go, let’s see if Watford pull it back,’ and off he wended, sidewinding his way back to the television. Result: Crystal Palace 1: Watford 0. For many it will only be stating the obvious to say that the physical and the psychic are one and the same. 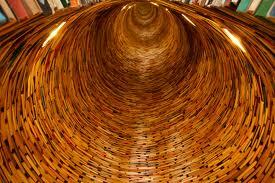 The very subtlety and sophistication of the Tarot’s vast reference library may be a weakness as well as a strength; a temptation to intellectualizing, which is NOT what is wanted, in trying to obtain a true result on Divination. Author Katie-EllenPosted on May 27, 2013 May 28, 2013 Categories agony aunt, business psychic, card meanings, cartomancy, clairvoyant, divination, dreams, esp, fate, future, ghosts, help and guidance, Intuition, Jung, Jungian archetypes, prediction, psi, psychic, psychic development, psychic writer, tarot, tarot case studies, UncategorizedTags Crystal Palace, Crystal Palace F.C., dowsing, FA Cup Final, forcasting, Gilded Tarot, Magician, Premier League, psychic, tarot, water dowsing, Watford F.C.2 Comments on Tarot Talks Fee-Fi-Fum-Football. A Tarot Reading to help with a business meeting…. I was looking in my cards to help Il Matrimonio. He was due to drive down to Leicester the following day, to meet with a telecom company with a view to a one off contract in Project Management. He wanted to know what hints and tips I might have for him, in consultation with the Tarot, and what was the forecast for the outcome. I drew The Chariot Reversed, The Six of Pentacles and Judgement. This row of 3 cards represented the story arc and timeline for the next day. Chariot Rev: Car trouble was possible, hopefully minor. I saw no injury. The following two cards were mitigating factors in deciding the problem was not too serious. The Six of Pentacles: I felt they might not want to pay the proposed rate of £850 daily. I felt they would offer a rate in the £600’s. Judgement: I saw a contract, comfortably acceptable as in the best interests of both parties. I warned him to drive with extra caution and that the daily rate was the obstacle to be negotiated as the man himself did not have the final say on budget for the task, but had to refer it to committee. There was nothing of sharp practise in respect of this to the best of my ability to detect. The Magician Reversed or the Seven of Swords would have been the signs of that, for me. As it was a reading for Il Matrimonio I did not have long to wait to know the outcome. The car problem was the exhaust. It pretty much fell off at Stoke. Fortunately he was not on the motorway at the time, and was able to carry out a temporary repair . He pulled in at a petrol station. He got oil on his shirt cuffs, and it was a bit fraught, but the car behaved thereafter and, getting the call, I booked it in at our local garage for next day. The company wanted the service but already had a list of preferred suppliers in situ. A rate of £650 was agreed and paperwork has now been signed with a contract for a few days work initially, perhaps more later. I feel there will be more because the Judgment card is like that. 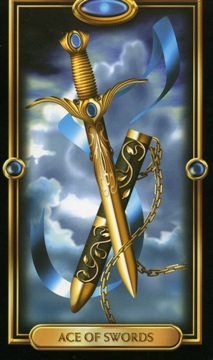 The Two of Swords also represnts a contractual agreement, but Judgement trumps it in terms of scale or longevity. Do as you would be done to. I’m still in disgrace of course, for not telling him it was the exhaust. Sorry, hubs. My – er-superhuman Remote Viewing Capability mustn’t have been switched on. So exciting! Well, maybe, if you’re interested in how psychic Tarot reading works. The Tarot’s Eight of Swords talking about…. real life damp and drains. There is Tarot you learn by book study. Then there is the Tarot you develop through experience, in which you discover or allocate new meanings for the cards via association and your own intuition. An example from my own experience is in readings featuring the Eight of Swords. The Eight of Swords from The Gilded Tarot, by kind permission of Ciro Marchetti. Standard Keywords: Frustration, feeling trapped or stuck, being unable to see a way ahead, chagrin, mortification, sometimes melodrama. A drama queen. One may be making a mountain out of a molehill. 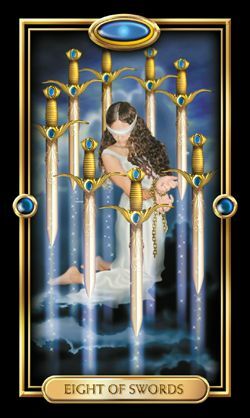 Passivity, the person is awaiting rescue when she only has to step forward with care and negotiate past the fence of swords, but she lacks focus, or else the nerve to try. This is what you will read in any Tarot study guide. But sometimes, you look at a card and think, no, that’s not it. Why not? Perhaps it makes no sense in the context of the discussion. What else is the Tarot trying to flag up for attention using the stock of images at its disposal? Your choices when this happens in a reading, dismiss it as an aberration or try to get to the bottom of it. Stay relaxed, an idea may present itself. No background was provided, and Tarot, like Reason likes a context. Nonetheless I decided to try rather than request further clarification first, and I drew The Eight of Swords in a key position. Response: She identified herself as a psychic living and working not far from me. My reading had answered the question she had not wished to specify. She had been thinking of converting her shower room, which was in any case old and tired and in need of a revamp, into a room for receiving her own tarot clients in. Now, she was going to reconsider. CASE STUDY TWO: A Skype reading for a family member, buying property for the first time in France. Was the flat a sound buy? The Tarot was rather negative, pointing out all manner of defects, structural and social, some of which she made sense of right away, being aware of them already. Others however, remained to be verified. Drawing the Eight of Swords I suggested the Tarot sniffed something diabolical (The Devil card) down in the basement. Uh oh. Trouble with the drains? This, she said, was not a problem. Nor need it be her problem in any case, as the flat she was after had no basement. The purchase went ahead, and she was delighted about the new home and remains so. However, the various problems sensed before purchase announced themselves one by one, and the drain problem declared itself almost immediately on moving in , when the floor had to be taken up in the communal entrance hallway to sort them. It didn’t matter, such is life, all the same, she was unaware of the impending work at the point of buying. One day the Tarot is going to use the Eight of Swords to tell me about someone’s toilet. I just know it. How rip snortingly excitin’, do I hear you say? No? The point is, Tarot is merely a map key of the psyche, tattooed on card stock. Man’s soul may be a butterfly, we’ve got to sweat the nitty gritty of daily life, so the Tarot’s insights will surely go there. 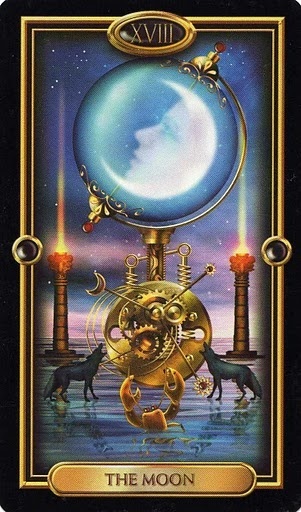 The Tarot card that might be talking about things going bump in the night, and we don’t mean burglars, or …well, you know…is The Moon card: Its meanings: Dreams, Illusions, Shadows, Psychic Perception, Deceit, Danger, Fear of the Unknown, Paranoia. Things that go bump in the night. If it’s filmable, if it’s reproducable, I don’t think it’s the real/unreal thing. Why? Because such experiences are perceptions of the Amygdala. The eyes see what the brain sees, projecting, not reflecting. This is the vision of the psychic eye. It does not mean that it is not ‘real’. Reports of ghosts may be considered suspect for a number of reasons. For one thing, they can be good for business…certain businesses. There was an interesting legal situation in the ’90s when a famously haunted Lancashire property, Chingle Hall, was sold at a value to reflect its haunted status with tourist income potential, which did not, em, materialise as substantially as expected. This doesn’t mean there aren’t ghosts anywhere, anytime, ye who cry scorn and derision. It’s something so easy to do, just dismiss it, if it hasn’t happened to you. Ghosts are not performing seals, or maybe it requires a certain kind of sensitivity to be open to that perception. Which begs the question, what is a ghost, anyway? Have I experienced anything of that sort, myself? Yes, I have, on a few occasions. The first occasion was long before I ever thought of learning Tarot, and it was extraordinary although the full strangeness did not hit me right away or even for some years. I was ‘fetched’ to a scene where a man had just died, and it turned out to have been the man himself who had done the fetching. There was the body, round the back of M&S in Leicester, there was the ambulance, and the paramedics, trying to resuscitate him, but he was now too far outside himself, and very shocked at its suddenness, poor man. These days, there’s a small dog on the staircase just now and then. I’ve seen it running down, fading in and out of view. Nothing unpleasant whatsoever. I’ve seen it in the kitchen and on the landing, and I’ve seen it run under the dining table. It’s the size of a large terrier with pricked ears and a short dark coat. I see the movement and the shape, not the detail. I imagine it’s some kind of energy residue; a print or a memory of a previous household pet. Other things over the years have been sadder, stranger, creepier, and I have definitely not wished to encourage them. I’m not asking if you ‘believe’ in such. If you don’t, you don’t, and many don’t. I get that. But, I have heard a lot of stories, presented quite matter of factly, by people in perfect possession of all their marbles. If you are interested, look up the books of TC Lethbridge, psychic researcher and academic with a scientific background. He said, ‘today’s magic is tomorrow’s science,’ and I think he’s near the mark. The world is not only stranger than we know. It may be stranger than we CAN know. Why should recognising possibilities and the limits of current understanding be a barrier to enquiry? Tarot, Runes, our dreams, myths and songs, are some of the many boats available for exploring these deep waters. Some may prefer to stay in harbour, and not explore at all, and that’s fine; they needn’t. But not everyone has the choice, the current pulls them out. I chose Tarot but I didn’t choose the things that went before, I learned they were part of my make-up. For all our intellectual achievements and aspirations, resistant to ‘superstition’ or not ‘we’ remain an instinctive animal. We rely on it for our safety. If someone gives you the creeps, then they give you the creeps, and there’ll be a reason. Police, Emergency Services Personnel, the Military, all need good instincts, or else. To be psychic is only an extreme form of instinct. This is our nature and our default. Factual truth may also be poetic. Stories come from someone’s experience, and myths and fairy tales from a collective experience. In this sense, however fanciful, even ghost stories contain some essential truth. They do not lie. A friend mentioned hair loss. It had begun, he said, the day after he had undergone a surgical procedure involving a general anaesthetic. He wondered if there might be a connection, and wanted me to ask the Tarot. Instead, I reached for my new oracle deck based on the Periodic Table. Yes. 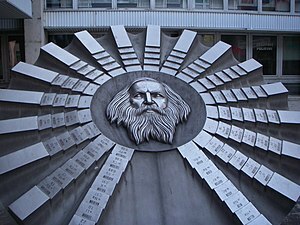 Mendeleev‘s Periodic Table as remembered from chemistry lessons and beyond. See his portrait, above. The friend has a background as a research chemist, and in view of the question, being an issue of biology or bio-chemistry, I thought he might be interested in seeing what I would get from this deck. I shuffled the cards blind, just as I do with my Tarot cards. What was causing S- ‘s hair to fall out? What was most relevant for him to know? I drew just one card. It said Potassium = Soundness. My friend expressed doubt. He was not aware of any particular connection between body levels of Potassium and hair health. Nor was I. I knew it only as a key metabolizer, a crucial part of the body pump that works in tandem with sodium, and that bananas are reputedly a good source. And found….plenty to suggest that there is a well-known, if not conclusively researched correlation between potassium deficiency ( hypokalemia) and hair loss. Use of certain medications, including corticosteroids, can create a state of lowered potassium with associated hair fall. and insulin, according to PubMedHealth. Citrus juices, tomatoes, bananas, canteloupes, lima beans, chicken, salmon, nuts and seeds are good dietary sources of potassium. The RDI of potassium is about 4,700 a day of which a banana represents only 450 mg. Care must be used with supplements. Excess potassium is as potentially harmful as low potassium. There are of course, other possible causes of hair loss. Iron, zinc and copper deficiencies, for instance, may also result in male or female hair loss. Whose card would it be? What would be its meaning? A meaningful reading needs a context. This one card reading from the Elemental Hexagon Deck is giving me much food for thought. It is the reader’s mind doing the work in a psychic reading, not the tools, be they cards, rune, dice, pendulums. These tools are translation devices, whose task is to pick up signals being beamed out from the readers unconscious or sub conscious, and to amplify them, so that the reader can consciously articulate them. I know far less about chemistry than does my friend, but the cards enabled me to ‘point into the wind’, and we both discovered something new…hopefully, the information may even help him.